The popular Movies in the Park series at Willis Tucker Park begins July 12th. Photo credit: Chuck Wright. 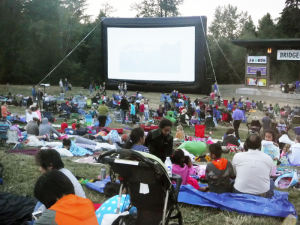 Enjoy a beautiful summer evening and a fun outdoor movie on Thursday evenings this summer beginning July 12th at Willis Tucker Community Park, 6705 Puget Park Drive, Snohomish, WA 98296. The pre-movie fun and entertainment provided by BridgeCity Church, North End Jazz, the Sno-Isle Library, and Community Transit begins at 7:00 pm. As the movies get started late, young families have come out in previous years and enjoyed the activities before bedtime. Seating is on grass so bring low-back lawn chairs and blankets for comfort. Admission is free, however, donations will be gratefully accepted to benefit the Snohomish County Parks Department. Open seating and pre-movie activities and entertainment begins at 7:00 pm. Movie starting times are approximate, depending on the daylight. Snacks are available for purchase from the Mill Creek Lions Club and include popcorn, candy, soda, water, and similar snacks. Please note that times are approximate and activities are subject to change.